(Nanowerk News) The 2014 chemistry Nobel Prize recognized important microscopy research that enabled greatly improved spatial resolution. This innovation, resulting in nanometer resolution, was made possible by making the source (the emitter) of the illumination quite small and by moving it quite close to the object being imaged. One problem with this approach is that in such proximity, the emitter and object can interact with each other, blurring the resulting image. Now, a new JQI study has shown how to sharpen nanoscale microscopy (nanoscopy) even more by better locating the exact position of the light source. Traditional microscopy is limited by the diffraction of light around objects. That is, when a light wave from the source strikes the object, the wave will scatter somewhat. This scattering limits the spatial resolution of a conventional microscope to no better than about one-half the wavelength of the light being used. For visible light, diffraction limits the resolution to no be better than a few hundred nanometers. How then, can microscopy using visible light attain a resolution down to several nanometers? By using tiny light sources that are no larger than a few nanometers in diameter. Examples of these types of light sources are fluorescent molecules, nanoparticles, and quantum dots. The JQI work uses quantum dots which are tiny crystals of a semiconductor material that can emit single photons of light. If such tiny light sources are close enough to the object meant to be mapped or imaged, nanometer-scale features can be resolved. This type of microscopy, called "Super-resolution imaging," surmounts the standard diffraction limit. JQI fellow Edo Waks and his colleagues have performed nanoscopic mappings of the electromagnetic field profile around silver nano-wires by positioning quantum dots (the emitter) nearby. They discovered that sub-wavelength imaging suffered from a fundamental problem, namely that an "image dipole" induced in the surface of the nanowire was distorting knowledge of the quantum dot's true position. This uncertainty in the position of the quantum dot translates directly into a distortion of the electromagnetic field measurement of the object. The distortion results from the fact that an electric charge positioned near a metallic surface will produce just such an electric field as if a ghostly negative charge were located as far beneath the surface as the original charge is above it. This is analogous to the image you see when looking at yourself in a mirror; the mirror object appears to be as far behind the mirror as you are in front. The quantum dot does not have a net electrical charge but it does have a net electrical dipole, a slight displacement of positive and negative charge within the dot. Thus when the dot approaches the wire, the wire develops an "image" electrical dipole whose emission can interfere with the dot's own emission. 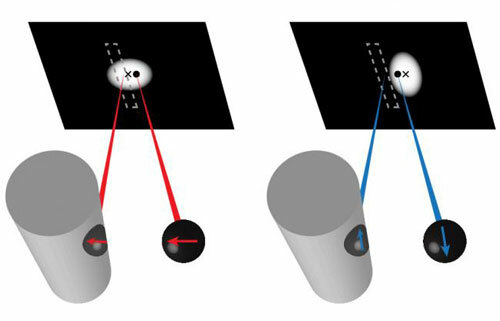 Since the measured light from the dot is the substance of the imaging process, the presence of light coming from the "image dipole" can interfere with light coming directly from the dot. This distorts the perceived position of the dot by an amount which is 10 times higher than the expected spatial accuracy of the imaging technique (as if the nanowire were acting as a sort of funhouse mirror). The JQI experiment successfully measured the image-dipole effect and properly showed that it can be corrected under appropriate circumstances. The resulting work provides a more accurate map of the electromagnetic fields surrounding the nanowire. The JQI scientists published their results in the journal Nature Communications ("Nanoscale probing of image-dipole interactions in a metallic nanostructure"). Lead author Chad Ropp (now a postdoctoral fellow at the University of California, Berkeley) says that the main goal of the experiment was to produce better super-resolution imaging: "Any time you use a nanoscale emitter to perform super-resolution imaging near a metal or high-dielectric structure image-dipole effects can cause errors. Because these effects can distort the measurement of the nano-emitter's position they are important to consider for any type of super-resolved imaging that performs spatial mapping." "Historically scientists have assumed negligible errors in the accuracy of super-resolved imaging," says Ropp. "What we are showing here is that there are indeed substantial inaccuracies and we describe a procedure on how to correct for them."